“Behold the Lamb of God who takes away the sin of the world … I am the resurrection and the life. The Church, as the Body of Christ, is a unique spiritual community having a specific charter and a simple message to the world. What was throughout the Old Testament history of Israel anticipation of things to come, has now become—through the death, burial, and resurrection of Jesus Christ—a message of fulfillment. Thus, the Passover feast—which reminded the faithful Jewish believer of the redemption of the nation from slavery in Egypt—has been transformed at the Last Supper (Mat 26:26–30; Joh 13–7; 1Co 11:23–26) into a celebration of redemption from sin and death by the finished work of Christ on the cross. Just as the ancient Passover was a reminder to Israel of their redemption, as an impetus to obedient living (Exo 13:1–3), even so, the celebration of the Lord’s table is a continual reminder of our Lord’s crucifixion and resurrection, and a challenge to live daily in the light of it. Every promise, principle, command, and teaching in the epistles is the “reasonable service of worship” (Rom 12:2)—what we might call the “spiritual common-sense way of life” that springs from the simple Gospel message. The sanctified life is the only “reasonable” response, from a divine viewpoint perspective, to the resurrection of our Lord. According to Paul, the simplicity of the Gospel message (Rom 1:16–17; 1Co 15:3–4) is an all-encompassing declaration, which implicitly includes all doctrine for the believer living in the Church Age. This “mystery doctrine” (Eph 1:7–12, 3:1–7), which could not be revealed or known until the Savior’s work on the cross was finished, now means that the totality of Church Age truth is “gospel” (good news) to those who believe. This is why Paul could say to the believers in Rome, “I am ready to preach the gospel to you who are in Rome also” (Rom 1:15b). He is not concerned with their evangelization, but rather with their edification. The spiritual growth and maturity that results from an accurate understanding of newly revealed Church Age truth he calls “obedience to the faith” (Rom 1:5). In fact, the entire book of Romans is a summary of the full scope of this body of truth. Of specific concern to Paul (via inspiration of the Holy Spirit) is that the Church understand and live out its unique, yet separate, identity and responsibility in relation to Israel (Rom 9–11). In fact, this is the particular aspect of the “mystery” that Paul does not want Christians living in the Church Age to be ignorant of (Rom 11:25). We dare not overlook the fact that only twice does Paul use the term “mystery” in the book of Romans. First, with regard to the present relationship of the Church to Israel (Rom 11:25), and then as the key by which the Church shall fulfill her mission. “Reclaiming our Biblical Roots”—the mystery of a New Creation. “Our Blessed Hope”—the second phase of the resurrection. “Taking the Enigma out of Paul’s Mystery”—Supernatural provisions for a special people. I encourage you to attend or catch up with these topics via the website! This recent mission-journey was the longest Nan and I have taken together (I went on a four-month mission long ago). We were gone for nine weeks, and every step of our journey was blessed; we felt so privileged to be a part of so many precious believers’ lives. It was great to be with John Francis and Aruna once again–to encourage them, and be encouraged, as they revealed how faithful and gracious God had been to them after the loss of their son, Caleb. Their faith has been tested in the fire, and has come through the trial refined—to the praise and glory of our Lord Jesus Christ. We had about sixty pastors and their wives for the study of 1 Peter. These were mostly remote village people, so the theme of the refining power of sufferings was eagerly received by these people who know the costliness of our faith. 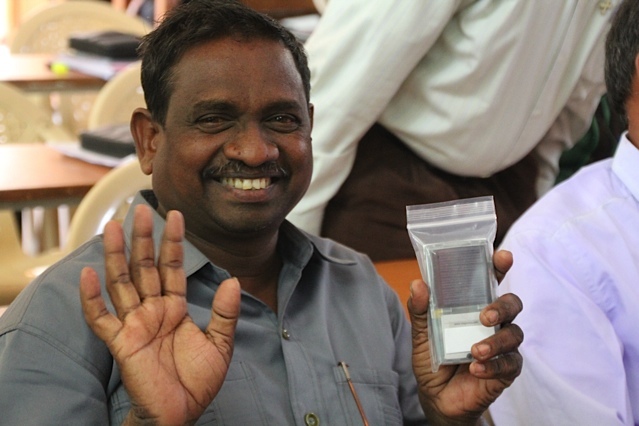 In addition to the daily teaching, we were able to distribute 45 small solar powered recorders, containing the entire Bible in Telugu. What a priceless gift this is! Many will be playing these in their villages where neighbors will gather to hear the Word of God. Nan really enjoyed doing afternoon ladies classes with village pastors’ wives. Their humility and hunger for God’s Word encouraged her heart in the Lord. From India we moved to Australia, glad to visit our children and grandchildren on both coasts, and to hold Bible conferences in both Perth and Canberra. In Perth, the theme was “The Fullness of God.” I was privileged to share the teaching with my son-in-law, Daniel Zanich who is now pastoring Cross Road Bible Church. In addition, Pastor John Francis from India taught the last two sessions and enjoyed a refreshing visit in Australia with his wife Aruna. We thank all who were unable to attend but supported us in prayer. It was good to catch up with Daniel, Katie, and their little Max, and our youngest son Gavin, who is in his last year of “uni” (university) in Perth. Please pray for Katie as she will be giving birth to their second child in June. Moving across to Sydney, we had a wonderful visit with Wil, Kris, Ari, and Ash. The conference in Canberra followed, which was very well attended from near and far. Our theme was “Eternal Security.” We saw how vital it is for the believer to have the assurance and confidence of security in Christ, not only for steady spiritual growth, but also to meet the obstacles and opposition of the enemy to our spiritual service to God. The need for this teaching was reinforced to us by Pastor John Francis. 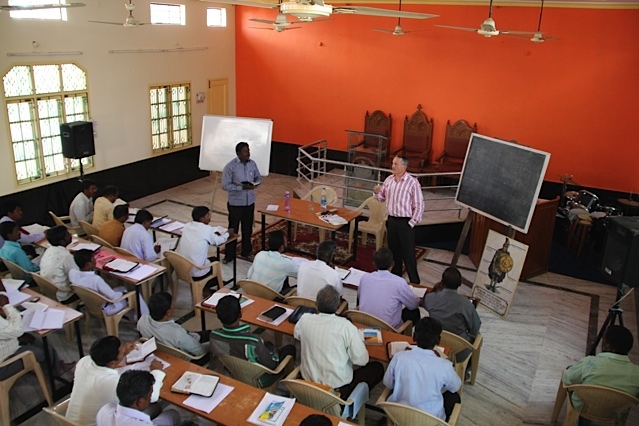 When he was at the church in Perth, he reported on the work in India and told the story of when we first visited India to teach God’s Word, none of the pastors believed in eternal security—himself included. But through the consistent, accurate teaching of the Word of God, they became convinced that the gift of eternal life is eternal and comes with absolute assurance. We have seen this to be true in so many places around the world. Watch for these classes from the Canberra conference to be posted soon. Finally, we journeyed from the modern cities of Australia to the remote village of Numba, PNG, and surrounding villages. We were glad to return after a two-year absence and find that the Word of God is having a mighty effect, as more and more graduates are going out to surrounding areas to minister the good news of the victory of Jesus Christ. Many of these students are selling their coffee crops and using their own funds to go far afield to preach the Gospel and teach the Word. Many reported going into hostile areas where they were met with suspicion and outright opposition, often suffering hunger and exposure, yet finally seeing the Spirit of God open eyes and hearts to the truth. Some are working in areas dominated by strange cults, yet are seeing many come to faith in Christ. One pastor said that while we were speaking, he had teams going to four surrounding provinces—at their own expense—and having great success. One husband/wife team went into a cult area and began teaching the children only to have the adults begin attending children’s classes, then beg for more teaching for the adults. This trip found us teamed with Pastor Doug Wray from Montana, and newlyweds Blair and Aurora Buselli (whose reports are included below). It was great working with each of them, enjoying the fellowship, the laughs, inevitable jokes and pranks, and times of prayer and mutual encouragement. Doug and Blair taught the new class of about 70 students, while I taught 1 Peter to the advanced graduates (65 in number). Meanwhile, Nan and Aurora spent time teaching the ladies and were off trekking to other villages for children’s programs, often through the driving rain and loving it! Neither rain, nor floods—or even snakes—could stop them! During the last week we were in Numba, Peter and Andrew from Cross Road Bible Church joined us. There are many ways to serve on the mission field; they came not to teach but to begin work on a project to bring running water from a mountain spring into the village. At present, the people have to hike down long steep mountain slopes to access water, so to have water piped into the village would be a tremendous asset and blessing. Please pray for this project. We have returned home with such gratitude to God for His faithful protection and blessing, amazed as always that He is able to use even us, and with far too many prayer requests to include in this report. We will, however, soon send out a prayer update, as there are many needs, and we know so many of you lift us up in prayer, and pray for our fellow workers around the world. Words cannot express our gratitude for your faithfulness, knowing that in eternity you will share a large portion of all that is done according to the will of God. We encourage you to “stand firm” in these very strange and perilous times, knowing that your labor is never in vain. Be on the lookout for the prayer report! 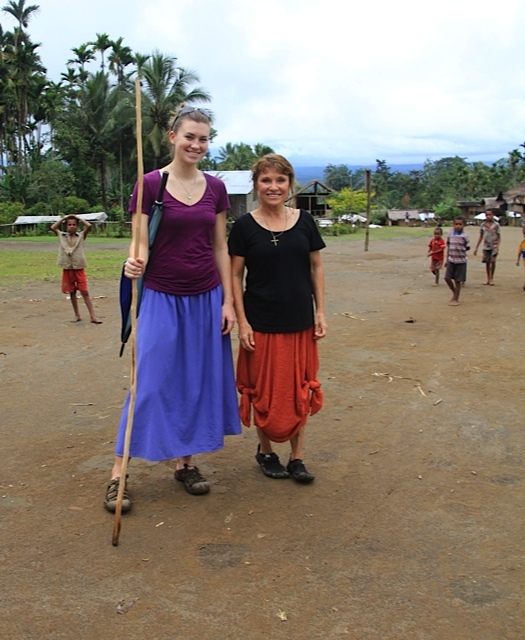 Aurora has desired to go to PNG for many years, and the door was finally opened. She heard Blair’s stories from his previous trip, and had been looking forward to seeing it with her own eyes. The passion of the people was contagious! Watching the women and the children soak up God’s Word during Bible study was the most rewarding part of the trip. It has inspired Aurora to continue to prepare for future trips to help equip these students with a deeper understanding of God’s Word. Watching the men and women being willing to sacrifice so much for spreading God’s Word has given Aurora great joy in being a part of the ripple effect of the Gospel in PNG. Two years have passed since Blair’s first trip to PNG. As soon as he stepped foot off the plane, it seemed as though he had never left, although he was soon to find out that so much had changed. That was what resonated with Blair the most—change. The village, in a snapshot view, was nearly the same as before, but it was the growth of the people that caused his amazement. The people of this little village that simply made themselves available to God’s will and opened their hearts to His teaching, is now being sent out to evangelize and teach the nation of PNG. 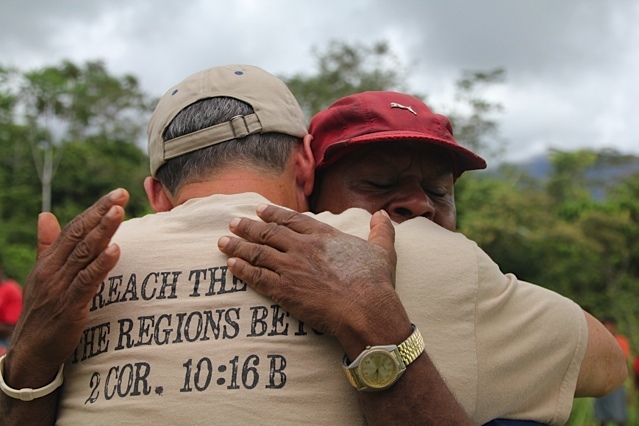 The way God is using these men and women to bring the Gospel and true Bible teaching through so many villages despite the oppositions and hardships is astounding. Blair is humbled to see such a great change in a short time. Like Timothy reporting to Paul about the Thessalonians—specifically their firm standing and growth in the Word—Blair and Aurora hope and pray that their lives can imitate the solid foundation and advancement that these people have accomplished in such a short amount of time. "The return trip back to Numba village was truly a blessing to all involved. The only disappointment was that I did not have my virtuous wife Kristy alongside to share the adventure with! But God’s plan is always perfect and He used her at home while I was gone. It was great to be able to serve with Gene and Nan once again and I really enjoyed my time with them. I also enjoyed meeting and getting to know and serve with Blair Buselli and his wife Aurora. They were truly a great asset to the mission. It was wonderful to get to teach the same group of students again this year! It was also a great experience to be able to share the classroom teaching with Blair. It worked out wonderfully and was very profitable to the students (according to Pastor Michael) as well as for us. It was truly amazing to see students from different churches, from different denominations—all working together when we split the students up into groups and had them work through passages! Then by the last day, we took volunteers from each group to get up in front of the class and teach what their group had learned from a passage! They did GREAT! I know of VERY FEW Christians in America (most of whom have had much more Bible teaching) who would be willing to do that! What an encouragement to all of us who have had the PRIVILEGE to see this kind of hunger for the Word of God! They want to learn the Word so they can teach it to others! Imagine if we Americans all had a little more of that! One of the things I have learned is that these students think that God sends us there only to minister to them, when in fact we are the ones who are taught so much by them! Someday they will understand the eternal impact they have had on their brothers and sisters on this side of the world! May we all consider their example to us and let it impact our lives as God intends for it to do! Thank you Jim Parlier and Gene and Nancy for inviting me to be a part of God’s work in PNG!"